"Negative and positive electricity had failed, so we tried static. If only we could have known the powers we were going to unleash!" We have an episode to watch! On with the DVD! The Dalek exterminates Kennedy. Waterfield enters and is horrified at what happens but is told to obey. The Dalek disappears, leaving Waterfield behind. He tears a photo of the Doctor placing half in Kennedy's hand and half in the edge of a box. The Doctor & Jamie enter the shop and examine the oddly new Victorian antiques. Jamie thinks Waterfield's invented a time machine but the Doctor says that's unlikely. They're met by Perry who has also returned to the shop. Entering the back room they find Kennedy's body. The telephone isn't working due to interference so Perry leaves to phone the police. The Doctor and Jamie find the hidden chamber but as Waterfield watches Jamie opens the box gassing him and the Doctor into unconsciousness. 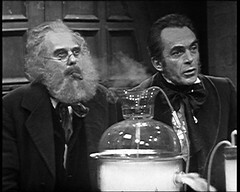 Waterfield activates the futuristic machinery in the room which vanishes taking Waterfield, the Doctor and Jamie with it. The Doctor wakes in a Victorian sitting room. Molly Dawson, a servant, serves him a revitalising tonic and tells him that he arrived late last night from abroad with Mr Waterfield. The year is 1866. 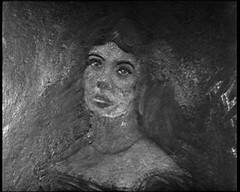 The house belongs to Theodore Maxtible, yet a picture of Waterfield's wife hangs over the fireplace. Waterfield's daughter, Victoria, is being held prisoner by the Daleks elsewhere in the house but refuses to eat feeding the birds her food. 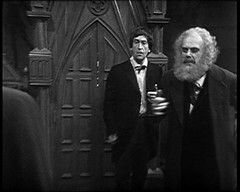 The Doctor is taken to Maxtible's lab where he & Waterfield explain their experiments with a cabinet lined with mirrors and subjected different charges of electricity. When they mention static electricity the Doctor is alarmed and a Dalek burst from the cabinet. The Doctor is needed to perform an experiment on Jamie. 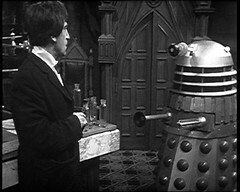 The Dalek enters the mirrored cabinet and vanishes. Jamie awakes and is served cordial by Molly. She goes to fetch him tea but a man, Toby, enters and knocks him out. When Molly returns she too is rendered unconscious and left on the sofa under a blanket. The Doctor & Waterfield return to find Jamie gone. Awwwww, what a good episode. Somewhere along the line the Doctor Jamie relationship has clicked. This is one of the first occasions they get extended screen time together by themselves and they're on cracking form here as they enter the antiques shop. JAMIE: I don't know what you're being so cautious about. JAMIE: They left the door open for us, didn't they? JAMIE: Hey, it's half-past the nine o'clock. JAMIE: But they made the appointment for ten. Why have we come early? DOCTOR: The early bird catches the worm, Jamie. Now do be quiet, there's a good chap. And for heaven's sake, don't knock into anything. DOCTOR: It's interesting. In fact, Jamie, it's quite remarkable. 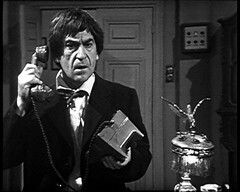 JAMIE: Hey, Doctor, you know you told me outside it said Genuine Victorian Antiques? Well, all the stuff in here's brand new. DOCTOR: Hmm, you've noticed that. JAMIE: Of course I did. The man's a rogue. DOCTOR: Except that all these things are not reproductions. They're all genuine. DOCTOR: Here, look at this. To one deed box, four guineas. This is a bill from William Dearing and Son, 1866. JAMIE: Then it's a forgery. DOCTOR: Yes. If you were going to make a forgery, wouldn't you try to dirty it up a bit? Yellow the edges, crinkle it up? This is brand new. JAMIE: I've got an idea. JAMIE: All the stuff in here is genuine. JAMIE: Well, that is impossible, unless Waterfield could have invented a time machine like the Tardis, Doctor, and he's bringing all this stuff back from Victorian times. DOCTOR: But it's not very likely, is it? The only way to find out is to ask Waterfield. 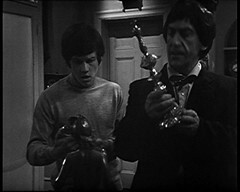 There's some superb business there with the Doctor knocking a statue over an Jamie catching it just as he says "And for heaven's sake, don't knock into anything!" DOCTOR: Yes, well, we'll have to find it before he comes back. Now I wonder what this telephone interference is. DOCTOR: Well, look at this. That's where your telephone interference is coming from. Oh, yes, this is interesting. Just as with Dalek Masterplan 8: Volcano and the cricket match I'm forced to wonder if a young Douglas Adams was watching? A similar idea crops up in Dirk Gently's Holistic Detective Agency but I'm struggling to remember if the same idea is in Shada, the cancelled Doctor Who story which "inspired" much of Dirk Gently's. The Daleks have had time travel before now, using a Tardis like vessel in The Chase and Dalek Masterplan. Here though the technology moves people and objects from site to site, like Star Trek Transporter or Blake's 7's Teleporter. In later stories this, or something similar, is referred to as Time Corridor technology which the Daleks use in Resurrection and Remembrance of the Daleks. We know there's something odd about Waterfield but it's still a huge shock to suddenly find ourselves in the middle of Victorian England. It's a good episode to survive as we get to see two of the three major locations in the story, most of the major characters and it's the first appearance of Victoria Waterfield, Edward's daughter, who'll be staying with us when the story closes. The painting of her mother that hangs in the hall is somewhat of an oddity though: what's a painting of Waterfield's wife doing hanging in Maxtible's house? Is she some how related to Maxtible, an older daughter perhaps? Has Maxtible bought Waterfield's house and left the picture hanging there? Or had Waterfield relocated to Maxtible's and hung the painting in pride of place? There's an oddity in the lab too: Before the Dalek reveals itself to the Doctor it can be clearly seen through the gap in the doors of the cabinet! MAXTIBLE: Please, please, Doctor. First things first. You asked what date it was and where you were. MAXTIBLE: You're in my house, some miles from Canterbury. The date is June the 2nd, eighteen hundred and sixty six. DOCTOR: And just what do you think you're up to? You steal my property, you spirit Jamie and me a hundred years back in time and you murder a man along the way. MAXTIBLE: We had nothing to do with the death of that man. DOCTOR: I don't believe you! MAXTIBLE: You will believe, Doctor. We are all of us the victims of a higher power. A power more evil and more terrible than the human brain can imagine. DOCTOR: Power? Victims? What do you mean? The word Power distinctly gets his attention: remember the last Dalek story, Troughton's first as the Doctor, was called The Power of the Daleks and a major plot point is them securing a source of power. WATERFIELD: They've taken my daughter, Victoria. MAXTIBLE: You will not be kept in suspense very much longer, Doctor. Pray, come with us and we will show you how it all began. WATERFIELD: Doctor, do whatever it is they ask, I beg of you. My daughter's life is in your hands. DOCTOR: I will listen, I promise. DOCTOR: Oh, yes, yes, very impressive. And now perhaps you'll explain what all this is about? MAXTIBLE: Patience, my dear sir, a little longer. DOCTOR: Patience? You don't seem to understand what's happened. A man has been murdered! You behave as though we're going on Sunday school outing. MAXTIBLE: Neither Whitefield nor I were responsible for his death. A cigar? DOCTOR: Why have you brought us here? Who are these enemies of yours, these ones you say control you? MAXTIBLE: Oh, I admit, Waterfield, they have behaved callously. WATERFIELD: Creations of the devil! The Doctor's interest is piqued again. MAXTIBLE: I have always been fascinated by the concept of travelling through time. Waterfield here is an expert in certain technical matters and I have the money to indulge my whims. Everything you see about you here was constructed by us two. DOCTOR: To try to find a way of exploring time? MAXTIBLE: Yes. Now this is my theory. A mirror reflects an image, does it not? MAXTIBLE: So, you may be standing there, and yet appear to be standing fifty feet away. Well, following the new investigations twelve years ago by J Clark Maxwell into electromagnetism and the experiments by Faraday into static electricity. The Daleks have been users of Static Electricity since their first appearance and it was referred to again in Power of the Daleks. For my reckoning this is the point where he figures out who he's facing even if he's hoping it's not them! MAXTIBLE: Correct. Waterfield and I first attempted to refine the image in the mirror, and then to project it. In here, Doctor, are one hundred and forty four separate mirrors. WATERFIELD: And each is of polished metal. Each is subjected to electric charges, all positive. MAXTIBLE: Like repels like in electricity, Doctor, and so next, Waterfield and I attempted to repel the image in the mirrors, wherever we directed. DOCTOR: You mentioned static electricity. See what I mean? He's worried. WATERFIELD: That was our last experiment. Negative and positive electricity had failed, so we tried static. If only we could have known the powers we were going to unleash. WATERFIELD: In the middle of our final test with static, creatures burst out of the cabinet, invaded the house, took away my daughter. MAXTIBLE: Oh, my dear fellow. My dear, dear fellow. But we shall win through now that the Doctor is here. WATERFIELD: We had opened the way for them with our experiments. They forced me into the horror of time travel, Doctor. They ordered me to steal a box belonging to you and thus lure you into a trap and transport you here, together with your colleague Mister McCrimmon. DOCTOR: They knew about me, these creatures. MAXTIBLE: They gave us likenesses. WATERFIELD: What could I do? They said my daughter would die. DOCTOR: What are they called, these creatures? DALEK: Doctor! Now do you understand? DALEK: Move back! Our plan has worked. We shall triumph! You will obey! You will obey! DOCTOR: Obey? Obey? What do you want? DALEK: We have your time ship. We will destroy it unless you help us with an experiment. DALEK: You will help the Daleks test another human being. DOCTOR: What sort of test? DOCTOR: I will not be your slave! WATERFIELD: Doctor, I beg you. DALEK: No harm will come to you if you agree. Where is your companion? WATERFIELD: He is in the house. I have done everything you asked me to. DOCTOR: Why do you ask about Jamie? DALEK: He is the human being who is to be tested. DOCTOR: What do you mean? Tested how? DALEK: Silence! You will reveal nothing to your companion. Obey the Daleks! You are in our power! This episode marks the first appearance of Deborah Watling as Victoria. The daughter of actors Jack Watling, who we'll see in a few months time, and Patricia Hicks she'd started acting as a child first appearing on screen aged 11. The previous year she'd appeared in the now missing second season Out of the Unknown episode The World In Silence as Sarah Richards. 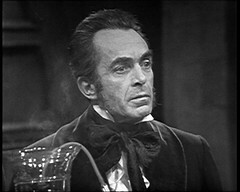 Victoria's widowed Father, Edward Waterfield, is played by John Bailey. He'd previously appeared in The Sensorites episode 6: A Desperate Venture as the Commander of the marooned group of Earthmen and would return many years later as Sezom in The Horns of Nimon. Evil of the Daleks 2 was recovered in May 1987 from the same collector as Faceless Ones 3 - see that episode for details as to how they were returned. Nobody quite knows how this lone episode of Evil of the Daleks made it's way into private hands but there is an incident that's worth noting: While involved in the making the BBC Documentary Whose Doctor Who in 1976, former script editor Terrance Dicks recommended a list of clips to use amongst which was "The Doctor meeting the Daleks in Victorian England". Evil of the Daleks was last sold abroad in 1970 and is records show the film print as having been junked in 1974. So how, two years later, was Terrance Dicks able to recommend using a clip from Evil? Was there a print in existence at this time, possibly this very print of episode 2 that now survives, that he was able to see which then went walkabout? Terrance sadly can't remember what he watched as research so we will probably never know. I first saw this episode in 1992 when it was released as part of The Daleks: The Early Years with Dalek Masterplan 5 & 10, Counterplot and Escape Switch, then the only surviving episodes of that tale. All 3 episodes were released on DVD in 2014 as part of Doctor Who - Lost In Time which is how I've watched this episode now. Sadly Evil of the Daleks 2 remains the only episode of this story in the BBC archives, so for the last 5 episodes of this story we'll be back on CD. Fans are keen to have Tenth Planet 4 back for the obvious reasons: Cybermen, last Hartnell, regeneration, historical significance etc, and Web of Fear 3, for the first appearance of Lethbridge-Stewart, then a Colonel before his promotion to Brigadier. But if you took a straw poll of Doctor Who fans then Evil of the Daleks would probably be the story that they'd most like to see completed.